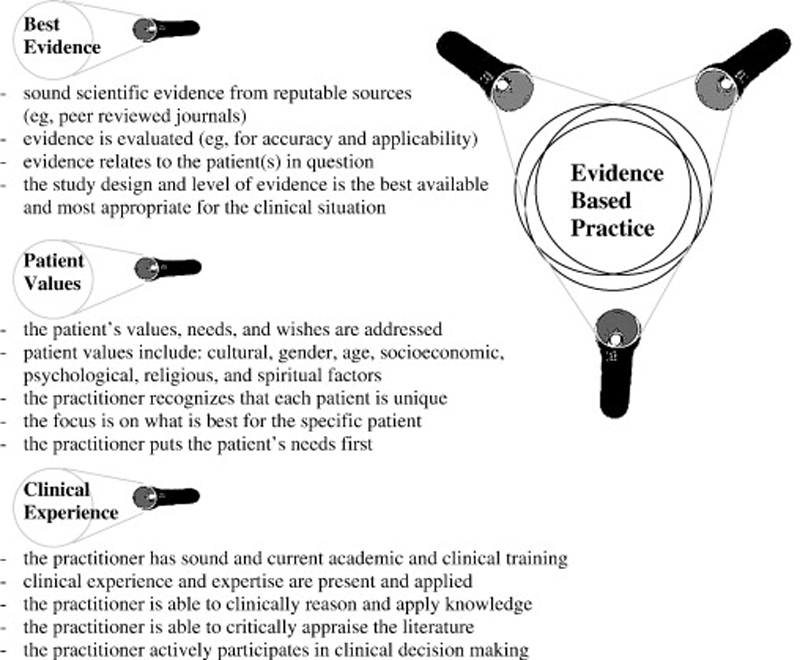 This editorial provides a brief review of the basic components of evidence-based practice. Evidence-based practice (EBP) offers a rational model for practitioners that allows them to provide the best possible care for their patients. However, for a few, there is a misunderstanding about EBP. Some people may think that EBP represents an “evidence-only” approach. Some may think that if multiple randomized controlled trials do not exist, then one cannot practice EBP. Others may misuse the term to mean “evidence only” such as to debate a point or to deny payment for healthcare services. The misuse of the term creates even more frustration and confusion for patients and for those practicing in the field, causing some practitioners to shy away from providing healthcare in an evidence-based way. It is possible that some of the confusion stems from being unaware of the full definition of this model. Upon review of the basic components of EBP, most healthcare providers find that the principles on which it is founded are simple, practical, and appeal to common sense. The concept of EBP was initially described in 1991. [1, 2] Since that time, many have expanded on this concept and various health professions have embraced this model as a means to improve patient care. [3–9] One may define EBP as “… the conscientious, explicit, and judicious use of current best evidence in making decisions about the care of individual patients.”  It is important to note that there are 3 fundamental components of the EBP model. Although each component is valuable on its own, it is not until all 3 are combined together that we truly have EBP. To shine some light on the matter, Figure 1 demonstrates the 3 components and their combination to make the EBP model. combine together with the aim of providing best possible patient care. Evidence-based practice makes sense because it helps to deliver the most appropriate care to the patient. This care is based upon the most up-to-date and appropriate scientific clinical evidence, the doctor's knowledge and clinical experience, and the values of the patient. Evidence-based practice requires that the doctor takes an active role in healthcare decisions and delivery. This means that EBP is a good fit for practitioners who are critical thinkers and have the best interest of the patient in mind. However, it is not a good match for those who wish to practice cook-book healthcare or have a primary financial focus (eg, the practice focuses on increasing revenues through practice management strategies) instead of a focus on what is in the best interest of the patient. Whether one is a doctor of chiropractic, medical doctor, doctor of osteopathy, physical therapist, nurse, or other practitioner, healthcare providers fundamentally want to do what is best for their patients. The fundamentals of EBP provide a sound foundation to provide best possible patient care. Dickersin, K, Straus, SE, and Bero, LA. Evidence based medicine: increasing, not dictating, choice. Sackett, DL, Straus, S, Richardson, S, Rosenberg, W, and Haynes, RB. Evidence-based medicine: how to practice and teach EBM. Users guides: essentials of evidence-based clinical practice. Sackett, DL, Rosenberg, WM, Gray, JA, Haynes, RB, and Richardson, WS. Guyatt, G, Cook, D, and Haynes, B. Evidence based medicine has come a long way. what counts and what doesn't count? Nicholson, LJ, Warde, CM, and Boker, JR.
improving evidence acquisition and critical appraisal. the bad, and the ugly in need of a review?